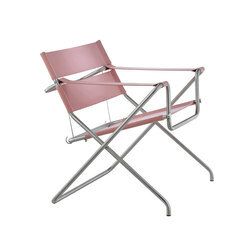 The architect and designer Marcel Breuer is considered the inventor of modern steel furniture. 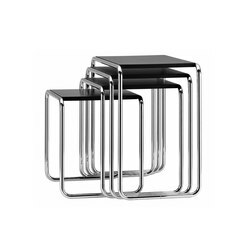 His minimalist cantilevered S 32 and S 64 chairs, and the B 3, or Wassily Chair, continue to be well known. Despite being known for his furniture design, throughout his life Breuer thought first and foremost of himself as an architect. Marcel Breuer was born on the 21st of May, 1902, in Pécs, Hungary and died on the 1st of July, 1981, in New York. At the age of 18, Breuer began studying art in Vienna, but dropped out. He then moved to learn carpentry at the Bauhaus in Weimar. Walter Gropius, the school’s founder, noticed the young man’s talent, taking him under his wing. By 1925, Breuer had become "Young Master" and was head of the furniture workshop at the Bauhaus. Because of his Jewish descent, Breuer soon left Germany, moving to Hungary, then to London, and finally to the US in 1937. There, he taught at Harvard’s Graduate School of Design, and founded an architecture firm with Gropius. 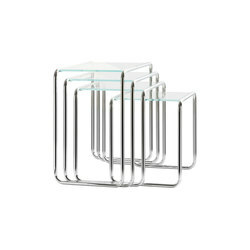 Breuer made his famous steel furniture mainly at the Weimar Bauhaus. 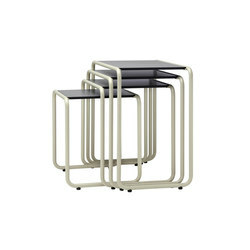 It was there that he created the Wassily Chair, the Laccio Tables and the B 9 Nesting tables. The core elements of Breuer's designs were steel tubes; inspired by the stability of the new Adler bicycles, they became his trademark. He combined the steel tubes with painted wood and textiles to create his unique, minimalist style. 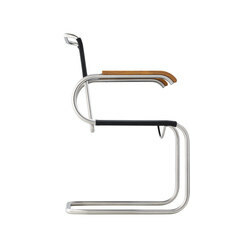 Breuer designed the classic S 32 by combining steel pipes with rattan and leather. 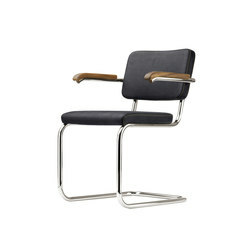 Eventually, Thonet acquired the license to produce the design, and added a version with armrests (S 64). 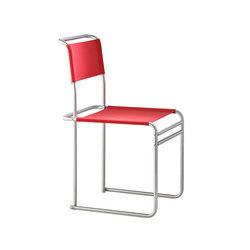 Breuer had been deeply inspired by Ludwig Mies van der Rohe’s MR Side Chair, which is considered the most well-known cantilevered chair and has enjoyed unparallelled popularity to this day. The B 3 is an abstraction of the then-popular upholstered armchairs, reduced to an almost transparent essence. The frame, made from steel tubes, and ribbons of fabric create the feeling of "sitting on springy columns of air" as Breuer himself said, and was inspired by Rietveld’s Red/Blue Chair. 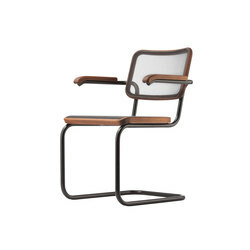 Wassily Kandinsky, a friend of Breuer’s at the Bauhaus, complimented the chair’s uniqueness, and so it became known as the "Wassily" chair. Marcel Breuer considered himself more an architect than a furniture designer. After immigrating to the US, he began his architectural career in earnest. Many of his buildings have become just as iconic as his furniture: they include both residential buildings such as Breuer Houses I and II, as well as public buildings like the Whitney Museum, the UNESCO headquarters in Paris, and Saint John's Abbey in Minnesota. He also designed the department store De Bijenkorf in Rotterdam. Breuer tried to bring regional touches to his buildings, particularly his houses, while keeping within the modernist idiom. More structurally daring buildings such as the Church at Saint John’s, and a ski resort in Flaine, France, also formed part of Breuer’s repertoire.